Currency pair Pound/Dollar GBP/USD continues to move as part of the correction and the formation of the «Head and Shoulders» reversal pattern. At the time of the publication of the forecast, the pound to dollar rate is 1.2932. At the moment, we should expect an attempt to climb and test the resistance area near the level of 1.2975. Where again we should expect a rebound and the continuation of the fall of the pound against the dollar. The target of the bearish movement of the currency pair, in the framework of the FOREX forecast for February 12, 2019, is the area at the level of 1.2645. The test of the broken trend line on the relative strength index (RSI) will be in favor of reducing the pair. As well as a rebound from the lower boundary of the bullish channel. Cancellation of the option to drop the pair Pound/Dollar will be a strong increase with the closing of quotations above the level of 1.3185. This will indicate a breakdown of the lower boundary of the channel and continued growth of the Pound Dollar pair to the area above the level of 1.3345. 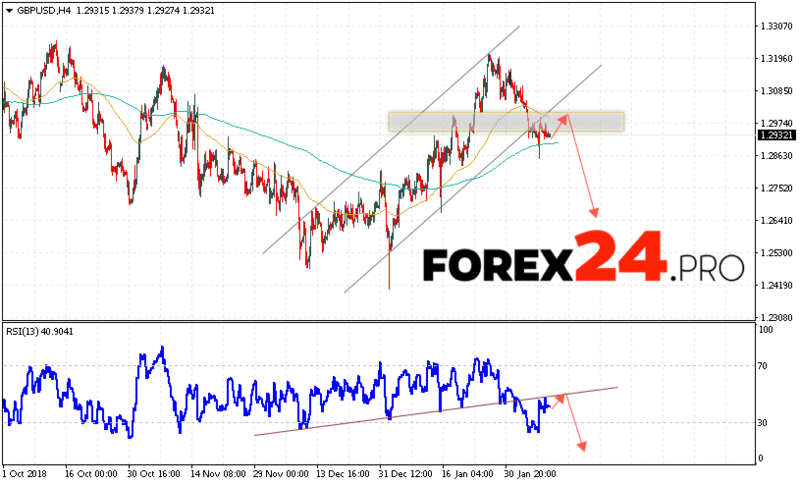 Expect to accelerate the fall of the pair stands with the breakdown of the support area and closing below 1.2845. Among the important news from the UK, which may have an impact on the GBP/USD pair, it is worth highlighting: Speech by the Governor of the Bank of England. GBP/USD Forecast Pound Dollar February 12, 2019 suggests an attempt to test the resistance area near the level of 1.2975. Then the continuation of the fall with the goal below 1.2645. An additional signal in favor of reducing the British Pound will be a test of the trend line on the relative strength index (RSI). Cancellation of the fall option will be a strong growth and the breakdown of 1.3185. This will indicate a continued rise of the pair with a potential target above the level of 1.3345.